The Shasta Trinity Endurance Challenge open series is provided to promote endurance riding by California State Horsemen's Associations (CSHA) State Endurance Program. This is an open series and has nothing to sign up for but the rides. There is no need to join anything. If you complete five rides on the same horse, any AERC sanctioned distance then you qualify to purchase a commemorative award (choices include, buckles, vest, jacket, fleece horse cooler). The rides in this series are not run by a club. The managers of the rides in Shasta and Trinity Counties are all independent, competent, dedicated individuals with their own management styles and ride philosophies and run their own rides and are responsible for all management decisions at their own events. This makes for a great diversity at these rides in the spectacular scenery of the top of the state!!!! The Redneck Ride is not on the flier, but Redneck Ride completions count toward this series too. It is in Shingletown and always the last weekend in October and is sanctioned usually a month or so before the ride. In support of longtime members, Kenny and Connie Creech, this year all proceeds from the Red Rock Rumble will go to assist in Kenny’s rehabilitation from his long term illness and his transition back home. This years ride is an opportunity for NASTR, and all who have enjoyed our trails and rides over the years, to say thank you and give back. Please join us at the Red Rock Rumble to say thank you to Kenny and Connie. The ride will be limited to 150 riders/entries. This is desert country - you'll ride a mix of cow trails, jeep tracks, sand washes. We try to find the best footing, but there will be rocky sections and some deep sand. Ride accordingly and make sure your horse's feet have adequate protection. The trails are generally rolling, not terribly difficult but there will be some areas that you have to take your time on - we want you to have the full Owyhee Front experience! Base camp: Teeter Ranch, outside of Oreana, Owyhee County, Idaho. We have plenty of space for any size rig. There are hydrants for people and horse water throughout the camp site. WiFi internet is available at the house where we will have all ride meetings, awards and meals. Hot showers, flush toilets at the house. Corrals are available for rent, $30 for the week. 12 x 12 or 12 x 16 panel corrals. Early arrivals are welcome, just let me know in advance! $100 for LD and 50/55 distances (includes dinner and camp fee). You've Done the "Toughest" Ride, Now Do the "Coolest"
COOLEST Ride & Tie, Equathon and Fun Ride - Cool, CA. This course is on the Beautiful Olmstead Knickerbocker trail that includes views of Sierra Nevada. Trail varies from single track to fire road, mostly rolling with a few of short/medium climbs - from easy to moderate. September 17, 2016 is rapidly approaching, and with that the Nevada All-State Trail Rider’s final ride of the NASTR Triple Crown. Please join us for the 49th Annual Virginia City 100 Mile Endurance Ride, held in historic Virginia City, Nevada. Lots of fun, excitement, and a challenging trail. Please help welcome Crysta Turnage, our new Ride Manager. Crysta has helped manage VC100 as a day and/or night manager several years while Connie rode (including last year) and has numerous years of experience as an individual ride manager. We have heard concerns over “new management” but rest assured you can still expect the same quality event as always. VC100 is still very much a NASTR club ride, and Connie is still highly involved in the planning and management. With the cost of holding this type of ride continuing to rise, it is more difficult for us to plan our ride without a headcount, however tentative. If you could provide us with a quick response as to whether or not you plan to attend, it would help us greatly in planning one of the oldest and most historic rides in the west. We will keep you updated with any important information or changes via email or Facebook, so please let us know if you will be attending this year. We also need a head count for Friday’s dinner and Sunday’s banquet. Come prepared to clean your camp site of ALL manure and hay. This MUST BE DONE before you leave ride camp. This does not mean spreading it out or throwing it over the edge of the hill. Nothing can be left behind to attract mustangs into town. NASTR has to pay a hefty cleaning deposit for the use of the Ice House, and throwing your hay and manure over the edge of the mountain, or leaving any hay or manure, will result in NASTR losing our deposit. Extra garbage bags will be available in the ride office. PARKING INFORMATION: Base camp will be held at the Ice House. Parking will be limited once again, having lost some of the lower section of parking. Last year the upper section was expanded, and we should once again be able to accommodate a small ride, without limiting the number of entries. There will be limited space for crew camping, so please take this into consideration. We will have volunteers to assist with parking. We ask for your cooperation and patience. Should you arrive Thursday or early Friday, before our parking staff, we ask that you please take the least amount of space as possible, and situate yourself to park close together and not block access. If you could double up (carpool), and limit corral space, that would be helpful. Thank you and we look forward to seeing you the third weekend in September. The ride entry, current Triple Crown standings, as well as historical stats on past winners, BC winners, Triple Crown winners, and buckle winners can be found here. Nevada All-State Trail Riders, Inc.
As you all no doubt recall, in 2015, for the first time in over 30 years, Old Selam had to be canceled due to nearby forest fires. Once again in 2016, the planets aligned and Idaho is besieged by one of the largest fires in the United States. Known as the Pioneer Fire, while the fire is at least eight miles from ride camp, the area of impact/closure includes not only Old Selam ride camp but the bulk of the trails. Out of the nearby ashes, Old Selam will arise like the mythical Phoenix, albeit our tail feathers are a bit scorched. After much furrowing of brows and gnashing of teeth, Southwest Idaho Trail and Distance Riders decided, in lieu of canceling the event a second time, to move the venue to Council, Idaho, (NOT CAMBRIDGE) where Friends of the Weiser River Trail has graciously agreed to provide the trail. We are trimming the ride back to a single day trail ride, 25 and 50, on SUNDAY, September 4. We will camp at the fair and rodeo grounds in Council, Idaho, on highway 95 just north of town (where we camped in past years for the Weiser River Trail Endurance Ride). The trail will be on an old rail bed, running north, much of the trail along a river, all of the trail very scenic. There will be one out vet check for each distance. HOOF PROTECTION IS STRONGLY ENCOURAGED. This is an old rail bed and while there are sections with absolutely no rocks, you can be assured that there WILL be rocks. I will be putting together a new flyer and should have that for you in the next couple of days, but meanwhile, if you plan on attending, please RSVP bbbivens@icehouse.net so we can get a head count. Hello everyone: Aspen Lake ride is approaching fast, Aug 27th. We need volunteers, for pulsing (in cam and out vet check), timers (easy job), hauling water(delivering water to the water stops on trail) requires a truck. Sandwich makers for lunches (lunch for volunteers, vets, ride management), we supply the makin's. There are many I have left out. So please come and volunteer, without volunteers there would be no rides. Great rustic/dry camping, easy access for large rigs. No corrals so plan accordingly. Bring plenty of people water, horse water supplied (THURS EVENING AND FRI AND SAT), for those of you coming early. Potluck Fri and Sat. Bring a dish to share. 50 and 30 mile sanctioned ride, 10 mile fun ride. All horses need to check in Fri evening. fun riders need to check in Fri evening, fun riders please call if you want to ride and cannot come in Fri evening. Would appreciate someone to stick close to me to possibly take over the ride next year, or at least be assist ride manager. Birthdays have a way of taking advantage, and there is a great need for ride managers for the Southern Oregon rides. This year's Virginia City 100 will be held on September 17th. This will be the first year that Crysta Turnage has taken over as ride manager from Connie Creech. The ride entry, current Triple Crown standings, as well as historical stats on past winners, BC winners, Triple Crown winners, and buckle winners can be found here. (It's not too late! There are currently three eligible teams who have not yet nominated themselves for Triple Crown). 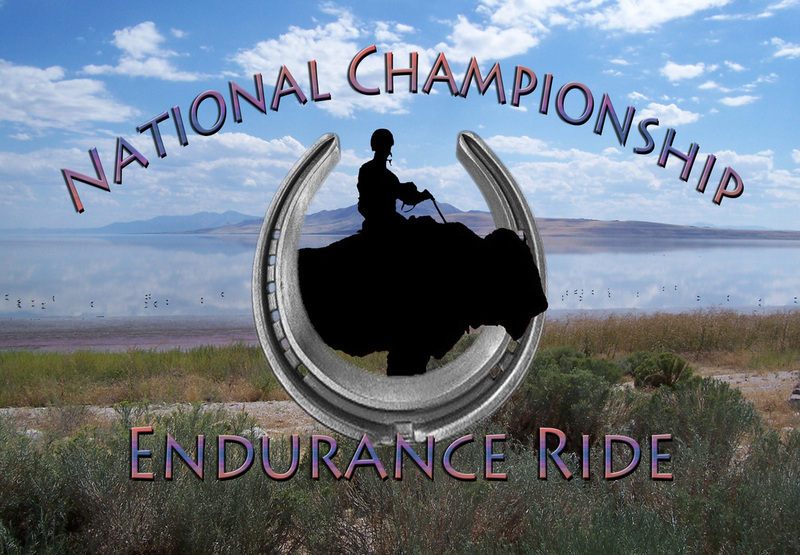 Are you planning on coming to Antelope Island Endurance Ride (Utah) for the National Championship ride? We now have entry forms ready for you to fill out and send into us. I know we are a few months out, but this is the time to start thinking about the ride and getting it locked in on the calendar. We will have the NC50 on Thursday (8th), a NON-NC (not associated with the NC) LD on Friday (9th) & the NC100 on the 10th of September. We will be having our basecamp at the historical Garr Ranch with plenty of parking for all size of rigs. We (Tonya Cmannie, Shirley Fox Brown & Jeffrey L. Stuart) hope that you will come to "Our" island to share in this fabulous opportunity to ride ride the National Championship ride with us. The Nevada All-State Trail Riders would like to invite you to attend the 32nd Annual NASTR 30/50/75 Mile Endurance Ride, the 2nd ride of the NASTR Triple Crown. 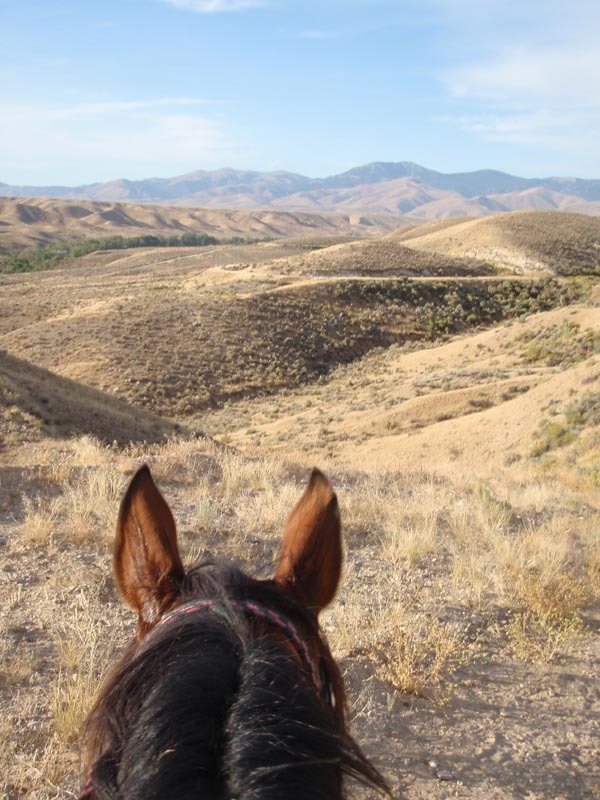 As many of you know the ride location has changed this year and we are very excited to be holding it at Scout Camp, in the Carson River Ranch area of Fort Churchill State Historic Park, Silver Springs, Nevada, the site of the fall High Desert Ride Series. Nancy Upham has graciously allowed NASTR to continue the use of this wonderful trail. We look forward to seeing you all June 25th !!! LOCATION / DIRECTIONS: The Scout Camp, in the Carson River Ranch area of Fort Churchill State Historic Park, Silver Springs, NV. Camp is located approximately 11 miles south of Silver Springs (where you may find fuel, groceries, feed, and auto supplies) via US-95 ALT. Just south of Buckland Station on the banks of the Carson River turn east onto Simpson Rd (the Pony Express Route). Follow the Pony Express Route 1¼ miles east and turn left through the cattle guard into the Scout Camp. Ride Camp is open from Friday thru Sunday. Scout Camp is located adjacent to the Carson River. It is a large, dispersed camping area that includes picnic tables, fire rings with grill tops, two vault toilets, and multiple horse corrals. Scout Camp is a carry-in, carry-out trash area. Horse manure needs to be picked up and carried out, or disposed of in the designated manure dump. HISTORY: The Carson River Ranches were acquired for public recreation in 1990, providing the first-ever opportunity to connect state park units. In 1994, the State of Nevada purchased the 3,229 acres of ranch land along the Carson River corridor between the Fort Churchill State Historic Park and the Lahontan State Recreational Area. Included in that purchase was the Bucklands Pony Express Station, which was restored and placed on the National Register of Historic Places in 1997. NASTR TRAILS PROJECT: In 1998 -1999, NASTR members provided volunteer trail building labor for the project at several work parties. The project included clearing and signage for seven trail heads, a rest room and horse corrals, camp areas and approximately 30 miles of trail connecting the two State Park units, as well as BLM lands. The trails accommodate nonmotorized users, equestrians, hikers, 4-h campers, hunters, mountain bikers and educational activities and canoeing on the Carson River. PARK RULES: All vehicles are subject to park fees, payable by cash or check only. Day Use NV Resident $5/vehicle/day ($7 nonresident). Overnight Camping NV Resident $12/vehicle/day ($14 non-resident). Quiet hours are in effect from 10pm - 7am. Pets must be kept on a leash no longer than 6-ft or contained inside a vehicle; owners are responsible for cleaning up pet waste. Fires are restricted to portable stoves and grills or fire rings provided by the Park; cutting, gathering, or removal of wood or plant material is not permitted. Leave no trace; please leave the area as clean or cleaner than you found it. TRAIL DESCRIPTION: The 75 mile ride will consist of two 30 mile loops and a 15 mile loop with two out of camp vet checks. The 50 mile ride will consist of a 30 mile and a 20 mile loop with an out of camp vet check. The 30 mile ride will consist of one 30 mile loop with an out of camp vet check. The trail traverses winding single track trail along the Carson River under the mighty cottonwood trees. Riders will enjoy scenic canyon climbs, desert washes, natural springs, stock tanks and dry lake terrain over jeep roads. The majority of the footing is sandy without many rocks, mostly flat with few climbs. Crews will have access to all away-vet checks. Hay and water will be provided by ride management at away-vet checks. PRE-RIDE VET CHECK: Friday, June 24th from 4:00 p.m. to 7:00 p.m. Head Control Judge is Susan McCartney DVM, assisting will be Marcia Smith, DVM. All horses must be pre-vetted and numbered before starting the ride. A pre-ride meeting will be held approximately at 7:00 p.m. STARTING TIMES: 75 mile ride - 5:00 a.m., 50 mile ride -6:00 a.m., 30 mile ride -8:00 a.m. AWARDS: Completion awards will be given to all successful finishers on all three rides. There will also be awards for the Overall Winner, 1st in each weight division, 1st Junior, Best Condition and Top Ten for both the 75 and 50 mile rides. A Best Condition Award will be given on the 30 mile ride. Please pick up your awards if you are not staying for the awards presentation, or have someone pick them up for you, otherwise they will be forfeited. MEALS: A barbeque dinner will be served on Saturdaystarting from 4:00 p.m. for riders and volunteers. Additional dinner tickets can be purchased for $10.00. Please purchase tickets included on the entry form, so that we can get a head count. The Ride results and awards presentation for the 30 and 50 mile ride will be announced at 6:30 p.m. 75 milers may serve themselves dinner after they finish and may pick up their award at that time. Juniors ride free with a sponsor. All non-AERC members must pay an additional $15.00. Cancellations by 6/22/16will receive a full refund. After 6/22/16 all but $20.00 will be refunded. No Shows will not receive a refund. A $25.00 fee will be charged for any returned checks. Checks will not be cashed until after the ride. The Gold Country Endurance ride is July 9 in the beautiful El Dorado National Forest. The ride begins and ends at the Dru Barner Equestrian Camp ground six miles east of Georgetown, CA. Our trails are beautiful and our volunteers are over the top! No crew needed, we take care of everything! Great ride for newbies, tough but no cliffs, well marked trails and an amazing Veterinary team. Dinner this year is catered Mexican Food and they do a great job! Pictures coming soon! The park has been closed for tree removal but reopens this weekend for the GDETF fun ride. For more information go to GCER.org. See you there! The ride camp is located in a large grass meadow near the Mt Adams Horse Camp. Weather can be very chilly at night, com come prepared! No open camp fires! There will be a communal fire ring near the vetting area. Ride management approved enclosed fires will be allowed. Manure removal services will again be offered by the Midnight Riders 4-H Club from Trout Lake. If you choose not to donate to the club, you will need to take your horse’s manure home with you since it’s USFS rules that all manure is removed from the field after the ride. Thank you for donating to the club! Certified weed free hay is required on all USFS lands. We will have a limited amount of certified weed free hay available for $14/bale. Please reserve yours asap by sending Darlene a message asap! Most feed stores also carry certified weed free hay. In Trout Lake, bear right at the service station/cafe (Andy’s) and follow signs and ribbons to the ride camp. While there, stop in and treat yourself to one of their famous huckleberry shakes or smoothies! Stephanie Irving, Trail Queen, No Mt Adams Ride would be complete without recognizing the efforts that long time manager and overseer and our official Trail Queen. She knows the trails up there like the back of her hand. She gives invaluable insight to the ride! Ben Volk, super runner, and endurance rider! Anna Sampson – Absolutely, without a doubt, the best timer, paperwork specialist, and results queen EVER. She makes it look easy! Planning to ride the 100 miler? Day 1 will be an outdoor/unmounted clinic to introduce you to the sport of AERC Endurance Riding - we will review how the competitions work, how to prepare the horse and rider and how to have not just success, but fun! This will include a powerpoint presentation, lots of photos, some video and web-surfing, some hands-on demonstrations of tack, metabolic checks of horses, a little bit about feeding and electolyting, as well as plenty of time for questions and answers. In the evening we will have a catered dutch oven dinner and campfire and will be great "practice" camping for you and horse horse(s). Clinic registration postmark deadline is May 7 and will be a first come/paid first serve with limited spots available. 10 ish mile endurance clinic at Willamette Mission State Park. This is a MOUNTED Clinic designed to give riders and horses an idea of what an actual ride is like. After the ride, there will be a Q & A session and lunch. Jeremy and I were busy glueing up horses in Easycare products the week leading up to the Fun In The Sun ride, Jeremy was CRAZY busy! This year the FITS ride was the first of three of the USA Time Trial rides, meaning the USA selectors and team veterinarians and Chef would be looking over nominated horse and rider combinations to start the selection process for the USA Endurance Team for the World Championship that will happen this December in Dubai. Because of this we had to be at the race on Tuesday so that we could have Honor examined by the staff. We loaded up Honor and Lou and went over to the ride. We had dropped off our LQ the day before so we took our smaller shuttle trailer over. Honor had his exam and Jeremy took Lou out for a ride. We were told that we were to camp at the ride from that point forward but lucky for us we were then told that that wasn't the case. We stayed at the ride site to have the dinner of shrimp and grits that Lynn Kenelly made for all, then we loaded up and took Honor and Lou home for the night and let them be in their pasture. We live about 20 mins from the ride so this was super. On Wednesday morning we rode Chachie and Rictik on their last training ride before they would fly to Dubai for a race we were invited to at the very last minute. The race is on March 19th and it is a 140 km race. An odd distance of roughly 88 miles. After this we loaded Honor, Lou and now Code back up and went over to the ride. We did the usual pre ride things that afternoon. Vetted in, weighed in and got things organized. Jeremy had to help out a few friends with their Easyboots while I got the crew stuff ready. Take the challenge in 2016! 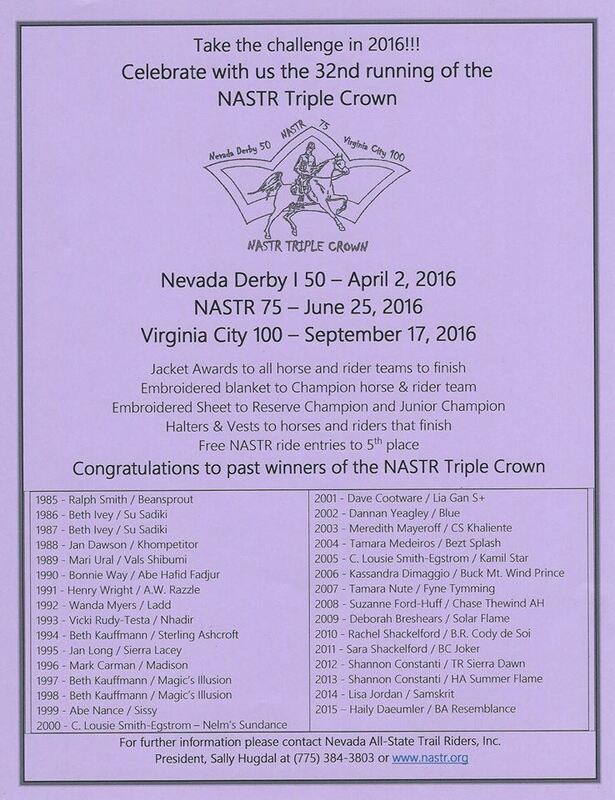 Hope you can join us for the NASTR Triple Crown! Nevada Derby 50 - NASTR 75 - Virginia City 100. We have a new date and a new location for the NASTR 30/50/75 this year. The ride will be relocated from Dayton, NV to the Carson River Ranches Scout Camp near Fort Churchill State Park in Silver Springs, Nevada. The new date is June 25, 2016. For further information see Nevada All-State Trail Riders. The camp is bare bones. There is horse water available, but for the most part you need to plan on bringing what you need. There will be no camp fires allowed. Parking is very limited so if you can trailer-pool then please do so and plan on parking conservatively. There will be a 50 mile and 30 mile ride. All holds will be in camp so there is no need for a crew. As there are no vehicles allowed in the ride area, crews will not be able to meet riders out on the trail unless they want to walk. The 50 mile ride consists of a 20 mile loop and two 15 mile loops. The 30 mile ride consists of two 15 mile loops. The trail is almost entirely sandy jeep roads and sandy single track, there are hardly any rocks. Ride camp is located off Red Rock Road, just a little north of Reno. Take the Red Rock Exit off US Hwy 395 and head east 15 miles. There will be ribbons and signs telling you where to turn right onto a dirt road. Follow the dirt road about a mile to camp.